The New Orleans was built in Pittsburgh for a cost of $38,000. The design was that of Robert Fulton. Financing for the project came from Robert Livingston: and, the boat was in the charge of Nicholas Roosevelt. The vessel was the first steamboat on the western rivers. Thus, she represented the introduction of steam technology to the western frontier. After Lewis and Clark returned to St. Louis in 1806, the launching of the New Orleans could be said to have been the next major historic event in the development of the West. The New Orleans was to descend the Ohio and the Mississippi River to her service destination, the city of New Orleans, where she would work the lower Mississippi River trade. On October 1, she arrived and dropped anchor in the middle of the Ohio River at Louisville, Kentucky. She arrived in the middle of the night; and, as she let off her steam pressure, the sound awakens the sleeping residents of the small frontier town. For the past few evenings, the residents had observed a comet in the sky. Before the sleeping town could find their way out of their homes many thought for sure the comet had fallen from the sky and landed in the river. If you look carefully, the comet can be seen in the upper right hand comer of my painting. On one of the following evenings the citizens of Louisville invited the Roosevelt family ashore for dinner. At dinner, Roosevelt told of how the New Orleans had the ability to steam upstream without the aid of pole, paddle, cordell rope, or sail. This concept was not imaginable by his dining companions. To return the hospitality an invitation was extended to his hosts to dine aboard the New Orleans the following evening. While dining in the forward cabin, the guest heard a loud clatter and felt the boat begin to move. Terrified, the guests thought the vessel was dragging anchor and they were all going over the falls and would be killed. 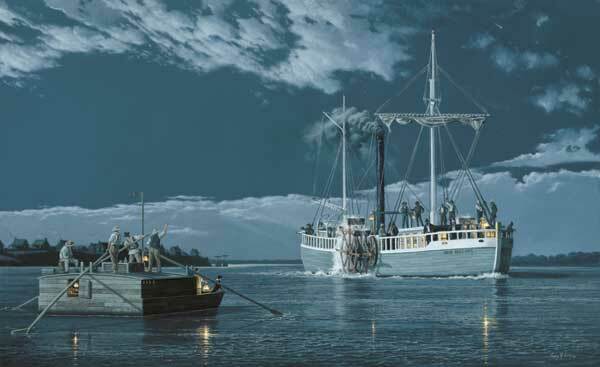 As they rushed up on deck, they realized, as Roosevelt had told them, the New Orleans had the ability to navigate upstream as well as down stream under her own power. In the painting, we see a moment in time when the business owners and leaders of the community must be gazing over the bow thinking about the future and what steam power will mean to them. 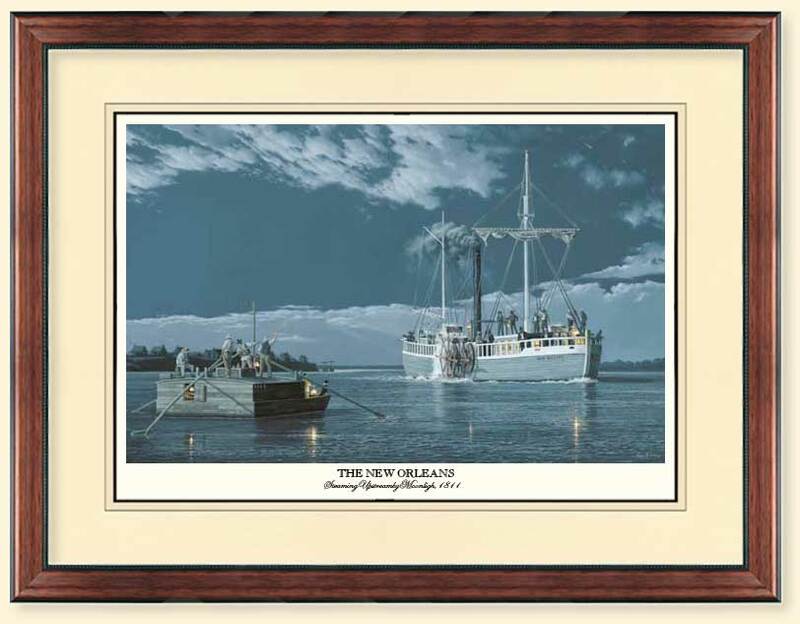 The depiction of the flatboat in the foreground floating with the current away from the viewer and the depiction of the New Orleans making way upstream under its own power is a symbolic gesture outlining a point in the history of the United States where an old technology makes way for the new. As the New Orleans makes its way down the Ohio and Mississippi Rivers, she finds herself in the middle of one of the greatest earthquakes in American history, the New Madrid earthquake of 1811-12. The Native Americans felt that the earthquake was caused by the appearance of the comet and this loud hissing steamboat, they called the "fire canoe".